Accessibility for New England is a proud authorized supplier of portable threshold ramps for EZ Access. In stock and available for immediate delivery. 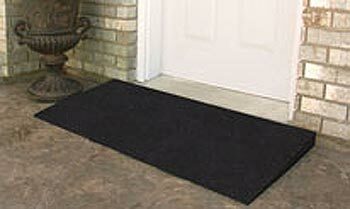 EZ-ACCESS Rubber Threshold ramps are designed for doorways and raised landings. This portable wheelchair ramp simply sits against the doorsill (inside or outside) to provide a smooth ground-to-sill transition and is especially practical for sliding glass doors because it does not interfere with the door track. Made of 100% recycled tires, EZ-ACCESS Rubber Threshold ramps are ADA approved, slip-resistant and designed for years of continued use. Can easily be trimmed for lower heights and widths to fit any entrance or threshold. Standard width is 48" (for wider entrances, simply place 2 ramps side-by-side). The Rubber Threshold ramp is ideal for indoor and outdoor use and because the ramp is fully portable, it provides the ability to move it to another door or location if desired. Optional pair of Rubber Risers can be combined with an additional Rubber Threshold Ramp to create a maximum height of 4¾. Supports up to 850-pounds and features a 1-year limited warranty. Made in the USA. Threshold is a lightweight yet portable wheelchair ramp designed for doorways, sliding glass doors, and raised landings. Threshold ramps may be used either one by itself or two combined to make entry and/or exit convenient and safe. Simply measure the height of the door entry and choose the correct size. Manufactured using high-strength aluminum (will not rust or corrode) and features an extruded non-skid driving surface. Easy installation. Supports up to 600 pounds and features a 3-year limited warranty. Made in the USA.